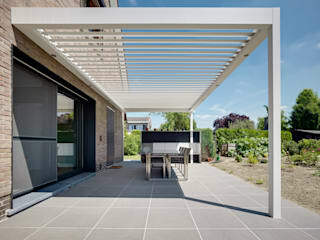 IQ Outdoor Living is an all-weather patio roof system and solar shading solution perfect for contemporary home designs and renovations, extending living spaces outside. 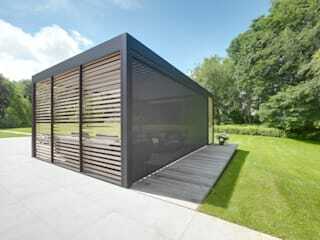 The contemporary aluminium louvre system functions as a sun and rain protection for a patio or terrace. 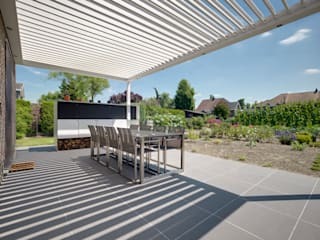 With integrated automation you chose how the louvres sit, thus creating a sunny or shaded and protected outdoor living area. 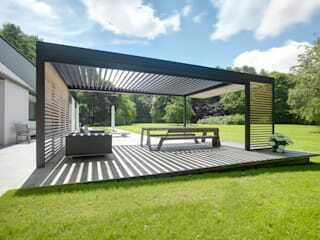 When closed the welded aluminium louvres site completely flat and interlock, creating a fully watertight patio roof. 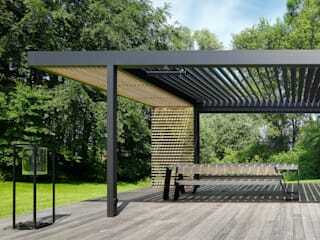 Umbris is an architectural louvre system. Each installation is tailor made and bespoke with colours, material, size, shape and dimensions of the louvres and supporting structure bespoke to your specification. 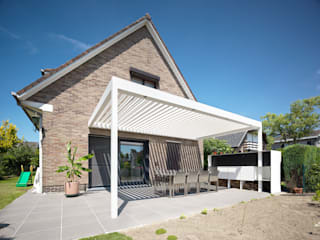 By using the highest grade aluminium for the main structure Umbris patio roofs can be designed at massive sizes with an enormous 7m gap between supporting posts as well as freestanding structures and cantilevered patio roof designs.